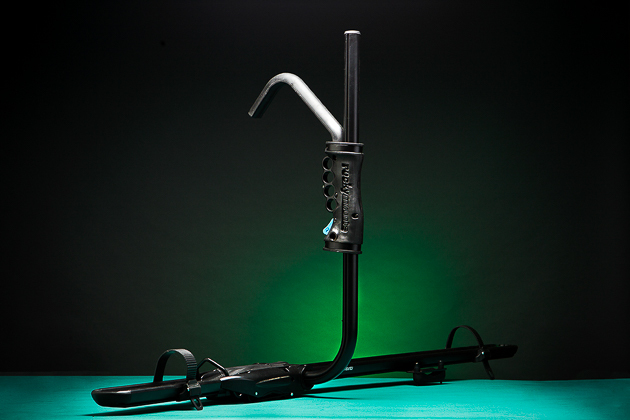 The BrassKnuckles bike carrier is easy to use and built to last using mostly metal construction. The arm has solid, definable clicks in the ratchet that don’t slip like other similarly-designed hook arm carriers. Also separating BrassKnuckles from its competition is its stance on the roof. Roof racks that don’t require wheel removal tend to be very bulky on the roof but BrassKnuckles lays nice and low. To top it off, it’ll easily install on any cross bar with only a 5-mil hex key. It’s not cheap, especially if you want to stick three or four of them on your roof, but it’s the same price as the competition, with a very solid build.